Recently Stanford called Me and we had an interesting conversation. I thought I would share it with you as you know I like to share what I can. It went like this. Staff member: GOAT, it’s him again. I reluctantly agree to take the call and gesture staff member to hold phone by my ear. Me: Hello Stanford, Happy Birthday for the other day. How may I help you? Stanford: Hello GOAT. 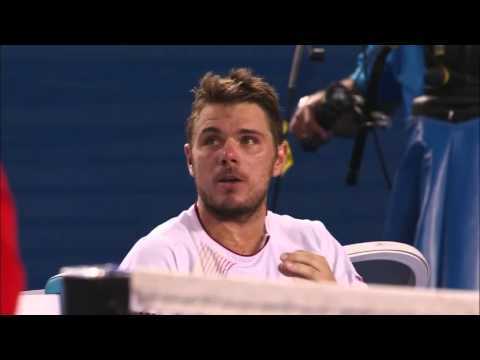 Did you hear about the Miami men’s semi finals and what happened? Me: Yes, of course I did. It was quite fascinating to see two retirements and such a shame for all players and fans. Stanford: Must have been annoying for you having just been beaten then he retires huh? Stanford: Do you know the medical reasons for the retirements? Me: No, it doesn’t really matter now but as I said, really sad and hope Tommy and Kei get back on the court as soon as possible. Stanford: We MUST be told the reasons. Where are the doctors’ reports? Can I download them from anywhere do you know? Me: No Stanford, it isn’t any of our business, let’s just wish them well. Stanford: No, it is a fundamental rule of the game that I am told every time a player feels ill, the diagnoses and prescribed medication. Me: No Stanford, this isn’t the Australian Open now. Just behave and sit quietly would you please? Stanford: Congratulations on the year you’ve had by the way. I know the commentators going crazy about your comeback. Me: Oh! Thank you yes. Stanford: Tell me again how you got to the Australian Open final? Stanford: You won Dubai, great! Has there been anything else? I won a slam so far this year. Stanford: Question, why do commentators say you don’t sweat when you simply do? Me: I don’t sweat, I glow. Anyway, when I sweat what comes out is Swiss Alps mineral water with a PH of 7.2. Stanford: I’ve heard it all now. Well, I hope you have a better year than last year, though that won’t be difficult even for you. Me: Staff are hanging up now, goodbye Stanford. have you totally lost it old man? Bwahahahaha- GOAT, you are The King, if it weren’t for you, tennis would be so boring…. Very nice, except that you forgot to capitalise a “me” and a “my”. Isn’t that tantamount to blasphemy?! Off late stanford is making the annoyings and angerings on you very often. Why have you not #firedhimyet #HRH? My #humble suggestion is that you should be making the considerings to even fire those picking and keeping the phone on Your ears. Stanford doesn’t know that you letting nishikoris to win caused him emotional breakings of down unable to accept the unimaginability of the pseudo victory, thus quittings of semi in pretexting of physical labor. May your glory be praised for all time to come and that which may not as well!